The Salvager’s Arts. Number 10 in our Keystone Chapbook Series and selected by Sascha Feinstein as co-winner of the 2011 Keystone Chapbook Prize. 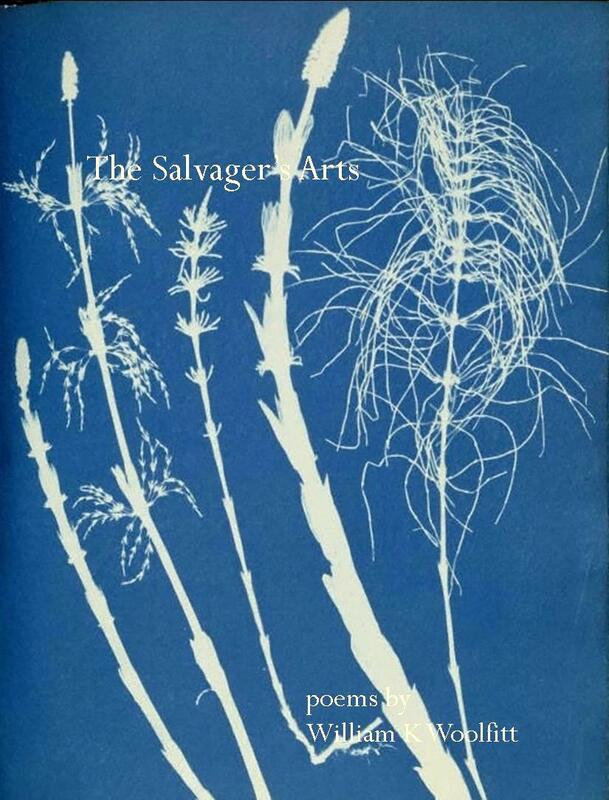 Cover image: Equisetum sylvaticum, by Anna Atkins & Anne Dixon. Cyanotype, 1853. Courtesy of J. Paul Getty Museum. William Kelley Woolfitt teaches creative writing and American literature at Lee University in Cleveland, Tennessee. He is the author of two chapbooks: The Salvager’s Arts (poetry), co-winner of the Keystone Prize, and The Boy with Fire in His Mouth (fiction), winner of the Epiphany Editions contest. His poems and stories appear in Shenandoah, Michigan Quarterly Review, Threepenny Review, New Ohio Review, Appalachian Heritage, The Cincinnati Review, Hayden’s Ferry Review, Ninth Letter, River Styx, Tin House‘s Flash Friday feature, Virginia Quarterly Review’s Instapoetry Series, and elsewhere. He has hiked a thousand miles of the Appalachian Trail and canoed the Chibougamau lake system in central Quebec; he explores the back roads of West Virginia whenever he can. We are the branches. In the vine we abide. he lashed together in teepee frames. but his life is in me. Rain is in the blossom, sun is in the seed. market vegetables we stir-fry in sesame oil. the rotten log of good-bye. Congratulations to Will for winning the 2018 Adrienne Bond Award for Poetry from Mercer University. His new book, Spring Up Everlasting, will be out in 2020. Congrats Will! That sounds terrific!